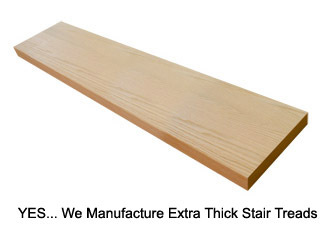 Manufacturers Of Thick Stair Treads In Many Hardwood Types From Stair Parts Canada. Thickness Sizes: 1-1/2", 1-3/4", 2", 2-1/4", 2-1/2", 2-3/4", 3" up to 4" Thick. We Sell Our Custom Wood Stair Treads Direct To All Home Owners Canada Wide. FACE GRAIN THICK TREADS: 1-1/2" & 1-3/4 thick stair treads can manufactured in standard tread construction methods at all times. This means the tread will ne made from 2" rough hardwood lumber and milled down to a finish thickness size of 1.5" or 1.75"; in the edge glue construction method, with face grain showing on both faces. 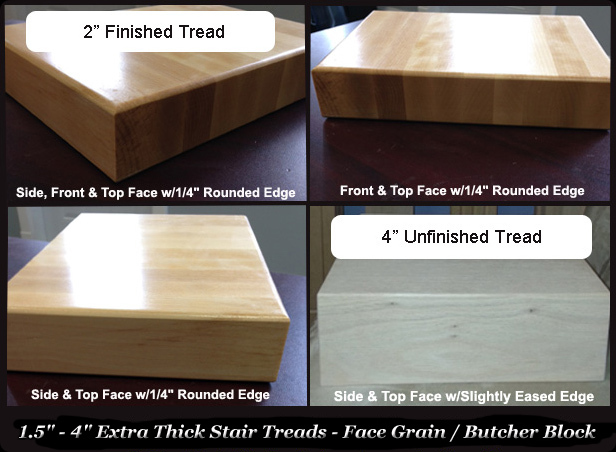 ( Note: at times we can manufacturer face grain thick treads at 2", 2-1/4", 2-1/2" and 2-3/4" so it is always best to ask for a quote on these sizes in both face grain and butcher block style, so you can compare the cost ). EDGE GRAIN THICK TREADS: 2" - 4" thick treads will manufactured in butch block tread construction method ( see note above 2" - 2-3/4" can at times be done in face grain method ), this is never a problem. This simply means the thick tread is made in the face glue construction method, with edge grain showing on both faces, like a butcher block. We can manufacture good two face open staircases out of many hardwood types to meet your job site needs. We supply are ready to assemble product or we can install it for you in our local service area. Our Good both face thick treads and stingers package will give you that full open concept design you been looking for! >>> For More Info On Open Good Two Face Staircase Packages: click here to go to our detailed web page.